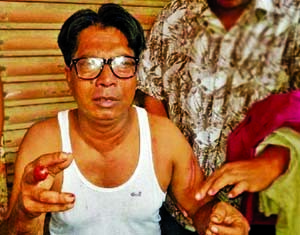 A Senior Officer of state-owned Sonali Bank was roughed up by two police men at Sataish of Tongi in Gazipur district on Sunday morning. The victim, Amir Hossain, whose middle finger was lashed in the attack, worked at the National University branch of the bank in Gazipur. He is a resident of Sataish bank colony. Amir Hossain said that he started for office hiring a rickshaw from near his residence around 9:00am. Sergeant Md Firoz and Constable Shyamal Datta stopped his rickshaw when it reached at the end of Sataish road. The rickshaw puller had an altercation with the police men. Amir said that he told the police men that he was leaving the rickshaw paying the fare. "But the police men hurled abusive words at me. All of a sudden they turned furious and started beating me mercilessly. My shirt was torn apart and I was bleeding as my fingers bruised," Amir Hossain told the media. Eyewitnesses said Amir Hoosain was heading for work by a rickshaw while a police constable and a sergeant stopped the rickshaw on the road. They argued over the matter and at one point both cops physically attacked Amir. As a result, he sustained injuries in one of his finger. Later, locals protested the attack and besieged the cops. On information, Tongi thana police and other traffic policemen rescued them. The injured bank official was taken to Tongi government hospital for treatment. Meanwhile, Sergeant Firoz and constable Shyamal have been withdrawn immediately and attached to Gazipur police line, said Gazipur Traffic Division Assistant Police Superintendent Md Saleh Uddin Ahmed.